During the 18th century the River Thames periodically froze over and the surface was solid enough to walk on. Impromptu celebrations known as Frost Fairs were held on the Thames. 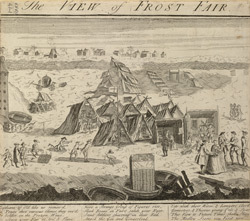 This etching depicts one such fair in 1740, including details of skittles on the frozen river, a Punch and Judy show and refreshment tents pitched on the ice.